Grate with large holed grater or chop the cauliflower into very small pieces so that it's similar to rice. Heat the cauliflower in a large covered microwave safe bowl for 3 minutes at a time and stir. Repeat until tender. 1. Place all ingredients in a large pot and bring to a boil. 2. 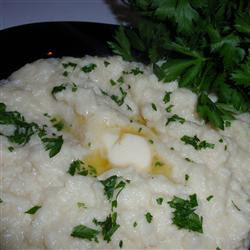 Reduce heat to medium and cover, allowing to cook for 15-20 minutes or so, or until the cauliflower is very tender and easily mashed with a fork. 3. Once cauliflower is tender, pour off any excess liquid and reserve. 4. Pour all contents into a food processor and gently mix. Add in sour cream, cheese if using or some of the reserved stock. Note - I mixed with my hand mixer until I had a blended but slightly chunky (like country smashed potatoes) texture. I really am fond of cauliflower mashed. Sometimes it's a nice break from all the heavy foods. Good collection of all different type of recipes and really very easy and quick to prepare of Skinny Cauliflower Recipes at home.